Join us for a history of the United States from the perspective of Indigenous peoples–centuries of aggressive settler-colonialism and Native Americans’ resistance–and its importance for understanding past and present U.S. foreign wars. Roxanne Dunbar-Ortiz is a longtime feminist, native rights, antiwar and antiracist activist. She is a teacher and the author of five books, including An Indigenous People’s History of the United States. 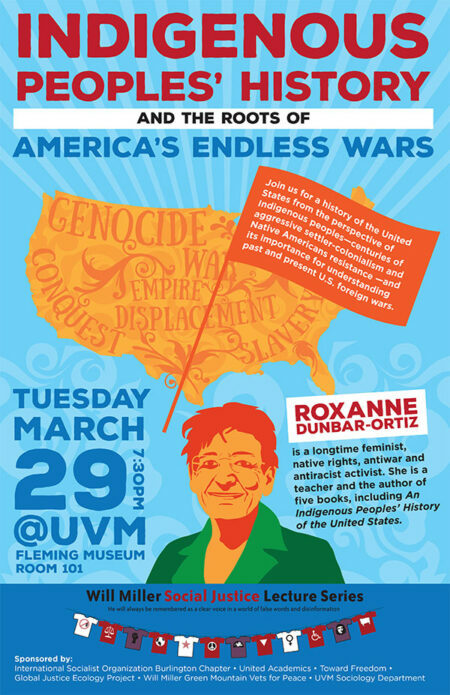 Sponsored by: the International Socialist Organization Burlington Chapter, United Academics, Toward Freedom, Global Justice Ecology Project, Will Miller Green Mountain Vets for Peace and the UVM Sociology Department. This entry was posted on Wednesday, March 9th, 2016 at 9:42 pm	and is filed under Previous Events. You can follow any responses to this entry through the RSS 2.0 feed. Both comments and pings are currently closed.